Dancing colourful beauty in the sky – ‘Aurora borealis’, the lights of the Northern Hemisphere, means ‘Dawn of the North’. 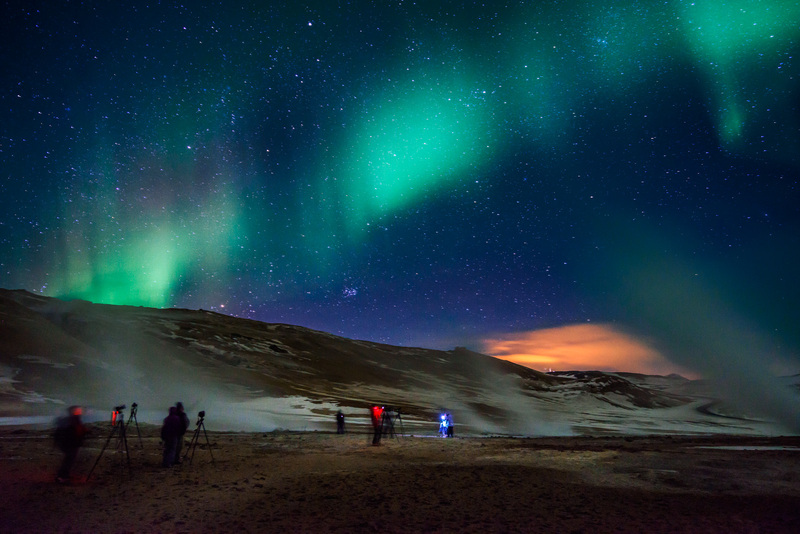 OK Adventure provides a Northern Lights chase from September to April. Both Evening tours and Day tours are available. Pick up from your hotel at 20:30. The tour takes about 4 hours. Before departure we check the weather and cloud forecast carefully. Clouds move and change rapidly in Iceland. Because of this our Northern Lights tours are on various locations. Usually we drive about an hour from Reykjavík, where there is less light pollution. We can not guarantee that the Northern Lights are visible but we will do our very best to find them. This is similar to fishing in water, you know that the fish is there, but it can be difficult to catch! Remember to bring warm clothing, hat, gloves or mittens. The travel route of the Day tour varies depending on the forecast. Pick up at your hotel at 12:00. We might take the Golden Circle; Þingvellir – Geysir – Gullfoss andthe Laugarvatn Fontana Geothemal Baths. We might have lunch in a local Icelandic restaurant, a farm or customized OK Adventure dinner. You never know! Then we hope to catch the Northern Lights. Or we might head to Borgarfjörður; Hvalfjörður – the Thermal Spring Deildartunguhver – a series of waterfalls Hraunfossar – Víðgelmir lava cave – Húsafell swimming pool and bistro. Then we hope to catch the Northern Lights. Please send us an inquiry and you will get an answer within 24 hours.